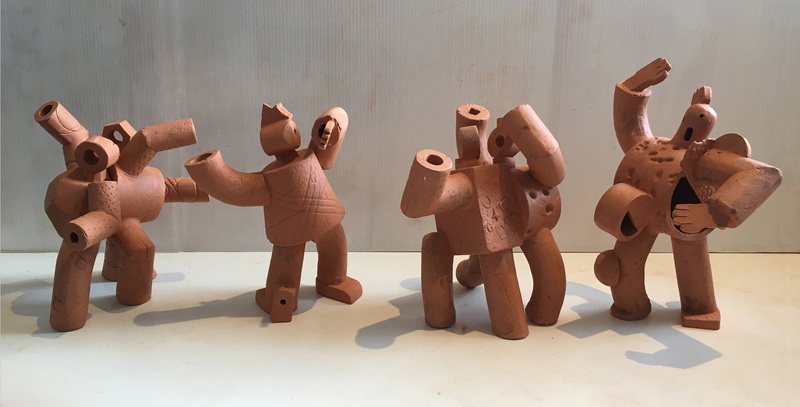 I make ceramics and draw, creating figures and structures that evoke personal and shared 21st century paradoxes. Much of my recent work is of (male) figures. This strand is one of the signs that I use my sculpture and writing to explore the rich complexity of being a man in the post-feminist era. The work is broadly figurative. Ceramics occupies an ambiguous place between art, craft and design, taking on different guises depending on how the work is conceived and how it’s shown. This mobility makes the medium even more flexible than the raw material and more open to manipulation and conveying meaning. My work has an experimental aspect, whatever I plan the work may not conform to my original map, it tends to find its own way with its own physical and visual logic. My ceramic work looks increasingly at what it means to be male in a diverse and fast evolving culture. In general masculine roles have changed much faster than the recurrent scripts that underlie them. My intention is to highlight the issues that arise from this paradox. I do not tackle gender politics by making propaganda, although it’s tempting to advocate my own opinion, it is more like the principal strand of my worldview, the background that puts my ideas into context. Currently I am working on sculptures of figures and hands. This is related to the decline of craft or ‘tacit’ (bodily know-how) skills in everyday work. The Artists Space is an opportunity for artists to meet with another artist and take an overview of the state of their practice in terms of personal meaning, long term aims, and job satisfaction and consider how they might progress. These sessions could transform your art practice simply by helping you use the information you already have about yourself and your work more effectively. The Restart blog is a previous set of a dozen posts on the A-N (artists newsletter uk) site on fundamental issues facing artists trying to establish and maintain a practice in the uk. If you would like to keep in touch with my Artworks news and events and The Artists Space you can sign up below for the occasional newsletter.